This week’s Vancouver Postcard Club meeting theme is New Found Treasures. 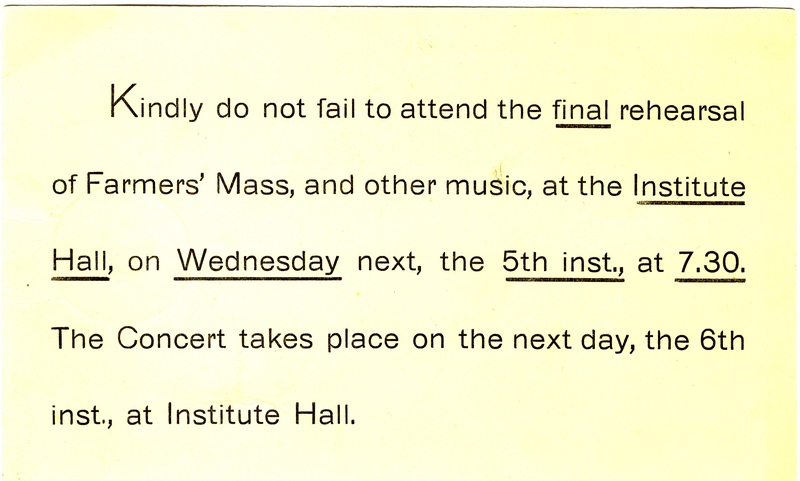 Here’s one of mine – a 1897 concert rehearsal reminder card. Oh, the days before e-mail! 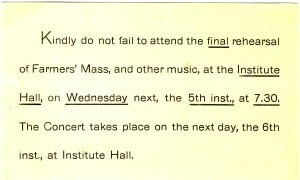 Rehearsal reminder card, Farmers’ Mass rehearsal, Victoria, BC, Canada, May 1897. Really I can’t quite read the name this card was sent to: W (or Mr.) Wall? Mull? and James Junr, Victoria – do you have another take on this? Or recognize the name? I did find this article about the performance of the Farmer’s Mass in the Victoria Daily Colonist, Sunday, 2 May 1897, page 8. Since this is not the best copy, see the digitized page copy by following this link. And according to an earlier newspaper report, there was to be a photograph taken of the orchestra, chorus and soloists at one of the rehearsals by Mr. Fleming (Victoria Daily Colonist, 29 April, 1897, page 5). Perhaps a copy survives? The performance was repeated at the Nanaimo Opera House later in the month as a benefit for the Nanaimo hospital. 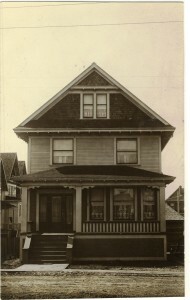 From the message, this house was on Yukon St. in Vancouver, BC, Canada, and the postcard may have been sent to someone in Winnipeg, Manitoba. The house # on the porch post appears to be “3035”. Message in ink on back as below. Unused postcard; one cent stamp box. I received your postal last week and was very pleased to get it. No I am not following Winnipeg fashion in the harem skirt although I certainly think they are an improvement on the hobble skirt. There are several girls in Vancouver that are wearing them. We had the loveliest weather during April, it was just like summer almost too warm, but it has rained nearly every day of this month. This is a picture of our house on Yukon St. were we live now. so if any of you come to Vancouver you will be able to find the house. Best regards to all, Ruby. Since I too once lived on Yukon Street in Vancouver, BC, I was immediately interested in this image, but I was also most happy to see Ruby’s mention of a current fashion in 1911 Vancouver – the harem skirt. Much more comfortable than the hobble skirts! And yes, I do have postcards featuring both harem and hobble skirts, mostly comic ones, but no others from Vancouver. 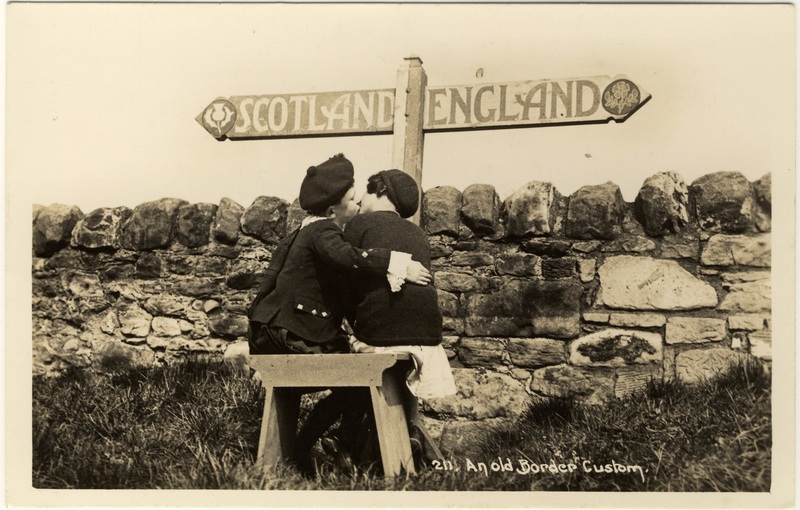 As Ruby’s message implies, they may not have lived there long before she sent the postcard. 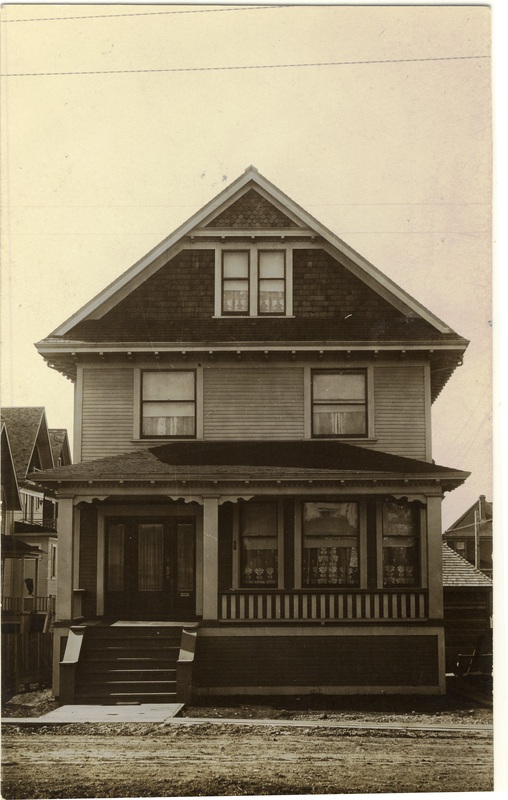 The 19091 directory shows John A. Gow at another address: 142-10th Ave. E., Vancouver. If thiis is the right Ruby, then in 1913 she married Norman Hull. I do have a file of tentative information on this family. 211. An old border custom. No other identification on front or back of card. It’s a New Year and the Vancouver Postcard Club‘s first meeting of 2014 will be at Hastings Community Centre, 11:30 am to 2 pm. Mike Hocevar will present rare and fascinating Japanese –Canadian ephemera of British Columbia, 1890s to 1940s. The meeting begins at 11:30 am so that members may view (and sometimes purchase) cards from other members’ collections. Usually there is a great variety of cards and this is a good time to get to know people and ask questions too. All interested in postcards are welcome to attend. An additional late note: The meeting tomorrow will be in the Community Hall Room at the Hastings Community Center. Walk through the parking lot to South end of building, past the big blue garbage dumpsters; the entrance doors will be near the sign on wall “Community Hall”. Coming up this weekend, Sunday, 17 November 2013 – the Vancouver Postcard Club meeting, starting at 11:30 am at the Hastings Community Centre, Vancouver. Club member Neil Whaley will present Vancouver Christmas postcards and ephemera. I’m sure we’ll be seeing some quite unique cards – and I do love ephemera. 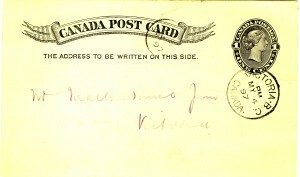 One of his cards is from 1887 when the City of Vancouver was just a year old. See that card on the Vancouver Postcard Club website. 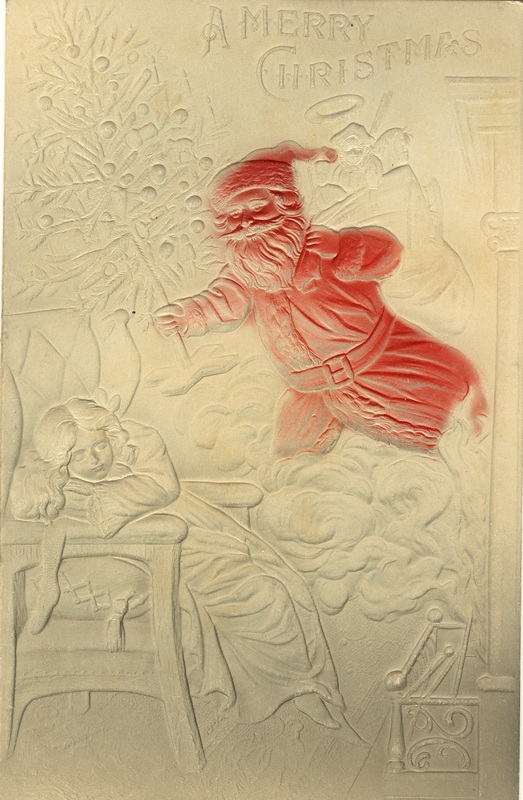 Here’s a lovely embossed postcard from my own collection showing Santa visiting on Christmas Eve. 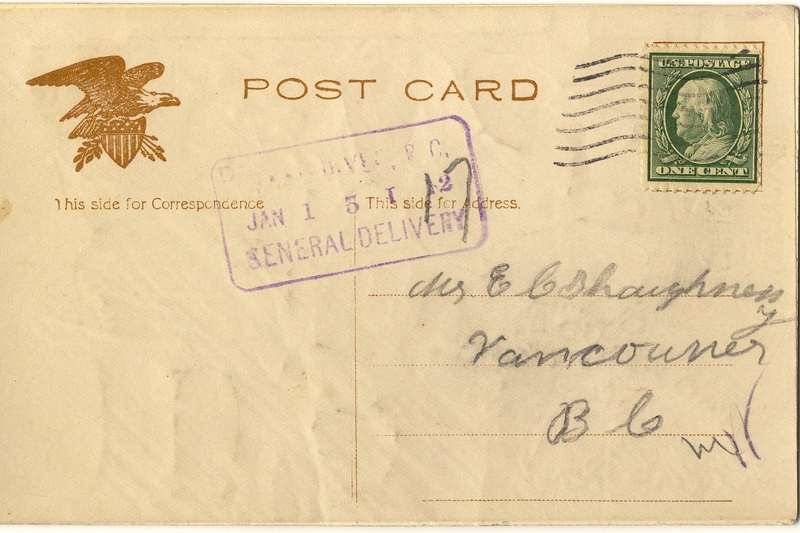 Mailed in the USA; stamped General Delivery Vancouver BC Jan 1 ? 5 ? 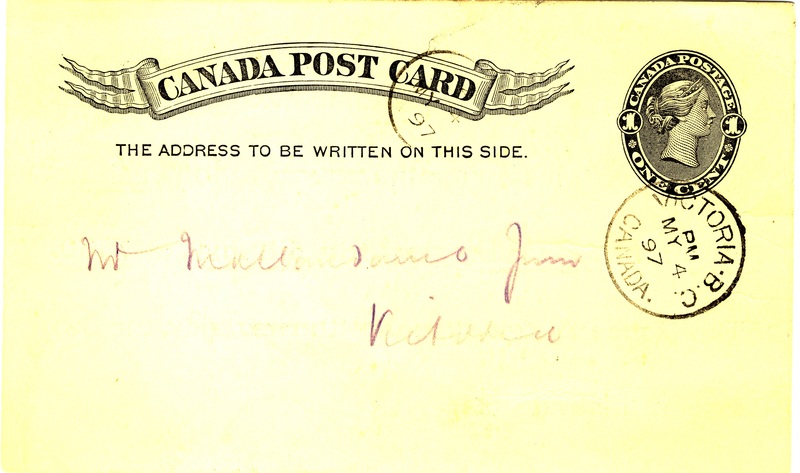 12m, and addressed just to Mr. E. C. Shaughnessy Vancouver B C. (possible Edward Shaughnessy).